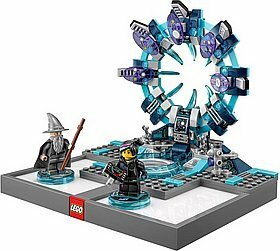 LEGO® Dimensions | Outer Rim Trading Co. - flat rate shipping Australia wide. There is an ancient planet at the centre of the LEGO® Multiverse inhabited by an evil mastermind, Lord Vortech. It is said that he who controls the Foundational Elements that this planet is built upon, controls all of the Multiverse. Lord Vortech has vowed to be that ruler, summoning characters from a variety of LEGO worlds to help him find these building bricks of LEGO® civilization. Some have agreed. Others have rebelled. And only the combined powers of the greatest LEGO® heroes can stop him.